As a young woman, I drank a lot of coffee. A LOT of coffee. Until a close friend told me one day she couldn’t get a word in edgewise, I was talking so much. I was so hyped up on caffeine it impacted my ability to listen! I cut down on my caffeine intake, but still drank a cup a day for quite a while. Then the acidity of most coffee started to bother my stomach. I found Starbucks to be the next best thing to rocket fuel, with the acid content to match the power of the caffeine. I had to cut coffee out altogether. 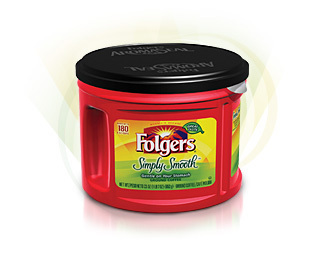 Now I only drink coffee periodically and there is only one brand I can tolerate: Folger’s Simply Smooth or Simply Smooth Decaf (if I want to spare my friends and family my auctioneer impression). According to Folger’s, they roast the coffee beans to reduce certain irritants that may affect a sensitive stomach. The caffeinated version coffee comes in 34.5 oz, 23 oz, 11.5 ounce tubs and is available in a decaffeinated variety in 23 oz, 11.5 ounce tubs. While I like the coffee, I wish Folger’s marketing team had come up with a better name. Simply Smooth sounds like a laxative, and that’s really what most stronger coffees are, not this gentler version of Folger’s coffee! To me, this coffee would be better named “Gentle Java.” But, as you know, I don’t work for Folger’s nor their PR team, so I can only drink their coffee and laugh at the name! The larger tub version of Simply Smooth is tough to find in stores. Target carries it, but lately I’ve only been able to find the small 11.5 ounce tubs. So, if you want to buy Simply Smooth in the larger size tubs, go to good old Amazon.com and get it shipped right to your door. Click on link here to get your own Folger’s Gentle Java (aka ahem, Simply Smooth) coffee. For another perspective, read Clever Shopper’s blogppost,”Folgers Simply Smooth Coffee: Finally a Coffee Gentle on the Stomach! !” here.